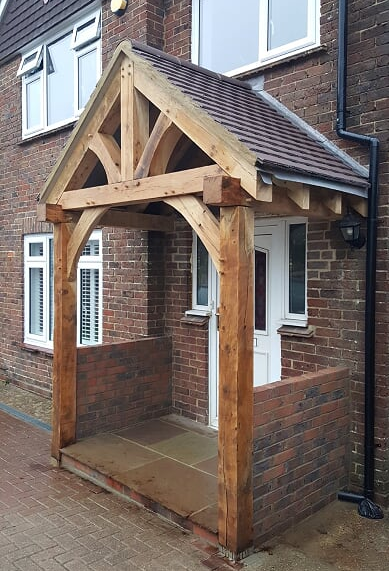 We created this oak framed porch for a client who was looking to add extra storage space to the front of his modern home to hold all those things; wellies, dog toys and soggy umbrellas; that aren’t wanted inside the main property. The porch needed to be in keeping with the rest of the property, while still giving a traditional appearance. The project was completed in just two weeks, and delivered to site in a kit form. As this was a bespoke design we started by attending site and taking measurements. The design of the porch was discussed with the customer and we showed several examples to help decide on the style and materials used. This is a service we offer across the country for any bespoke design work. With the initial measurements and a design brief we then returned to our offices to create a 3D scale diagram of the finished porch. The 3D scale diagram allows us to double-check all our measurements, and see how the finished design will look before we start work to ensure the client is happy. 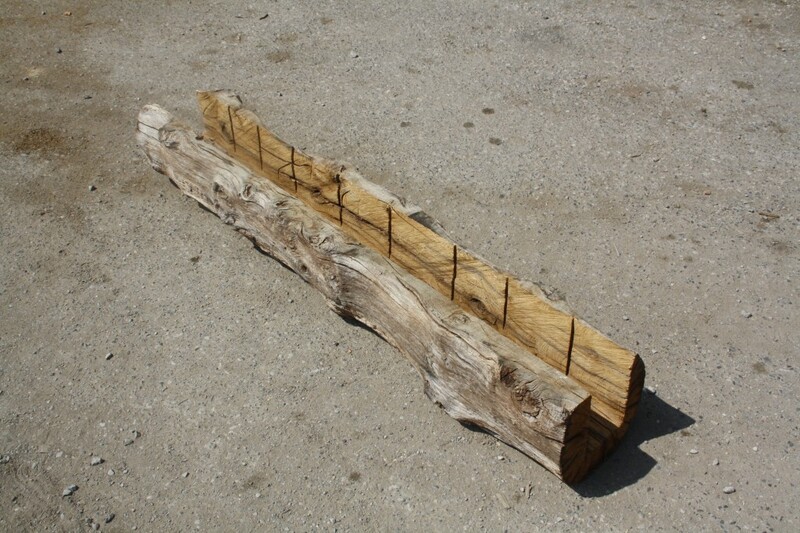 With the customers agreement we used 150mm x 150mm beams in air dried oak. 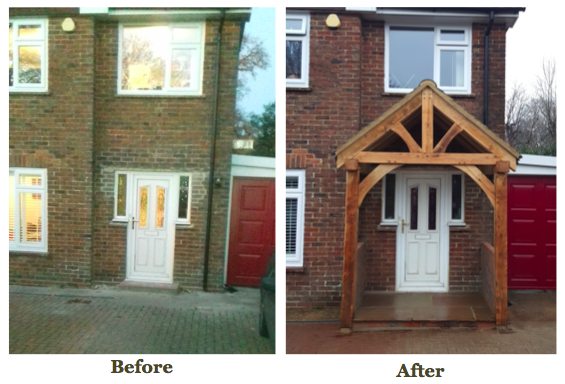 Anything smaller would look out of place, and as the customer was planning to construct the finished porch himself this allowed for easy construction. This particular project is ideal for air dried oak as it allows us to get a regular finish and obtain a cleaner, more modern look. The wood will age down to a grey finish, in keeping with the more modern property and the current oak fencing and trims. 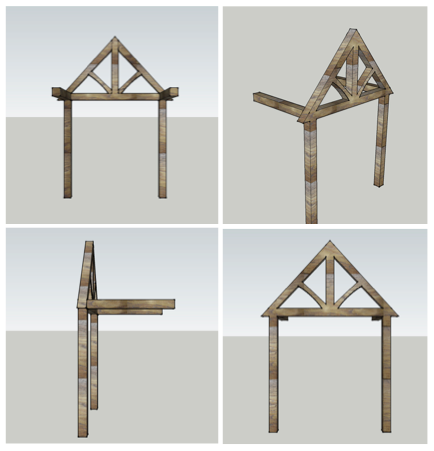 Creating the timber frame was quite intricate and precise work. At the top of the porch 3 pieces of oak come in as one joint at the top section with a tye beam across the front. This was all hand cut and the angles needed to be perfect to make sure the finished porch was straight and fitted together well after construction. We provided progress pictures at key stages and Chris, our client, visited our site several times to see the construction underway. This meant we were also able to offer some helpful tips for assembling the finished porch once he received it. After the oak was cut the porch was fully assembled in the yard, to ensure all measurements were correct and photographs of the finished item were sent across to Chris. It was then dismantled, given a final sanding, packaged up and delivered to site for construction in kit form. In this instance the customer is a carpenter. Although he specialises in second fix carpentry rather than timber framing, he chose to construct the finished porch himself with the assistance of his son. He was confident in the accuracy of the kit supplied and our communication throughout the process meant that we were able to offer key bits of specialist advice to allow him to use his existing skills to achieve a great final result. The finished porch is intended to remain open at the front, though in the future there is space to add glass panels to the brick and oak side walls to make them a little more weather proof.